Hi to all . i just want to say a big thank you to every one at BHR for there support and the proffesional way that my transplant was carried out, from start to finish with Stephen patient co ordinator and Dr Bisanga both giving me good honest advice also right through to the clinical staff on treatment day all top notch a very caring bunch of people. 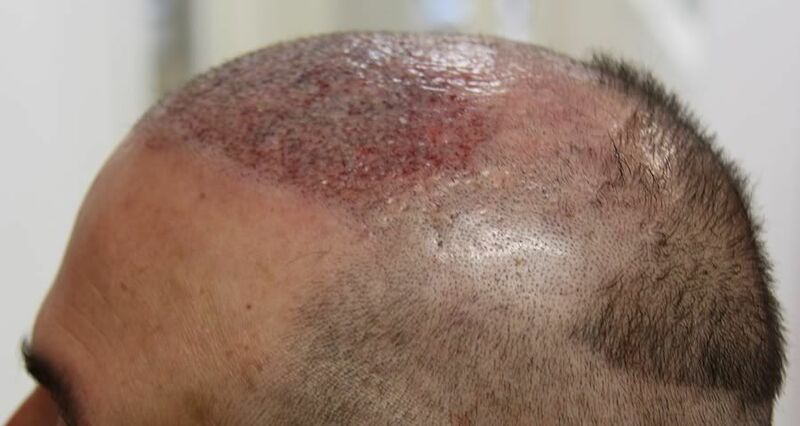 Allready in day four my scalp is looking so much better, this is due to the way the grafts have been placed very neat and tidy unlike the flaky battle ground you see in my pre op photos. i am due to have my stitches removed in six days, Dr Bisanga has closed my strip very neatly and i am sure that i will have very minimal scarring with this type of closure. Synthetic came to us after have two previous surgeries and 17 years of wearing synthetic fibres. First surgery was 2002 whereby he had a 1000 strip with another doctor giving him a frontal hairline but nothing else. He then proceeded to have a 300 FUE surgery the same year elsewhere which resulted in little to no growth and left evident scarring in the donor area. 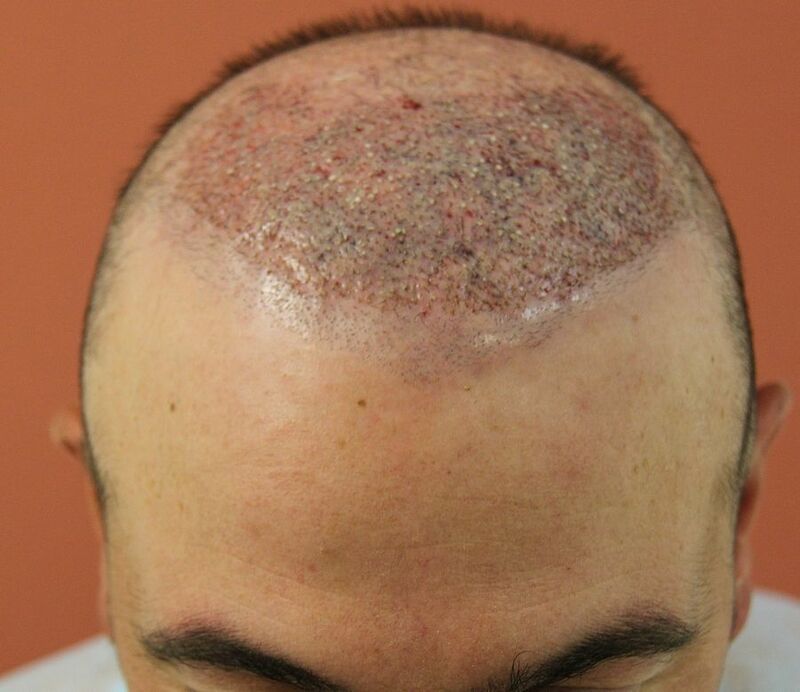 The years of synthetic fibre wearing took its toll on his scalp resulting in widespread scarring, pitting, inflammation of the scalp as evidenced in the pictures. The aim of this surgery was to use the limited donor area available to give coverage from the hairline going back into the frontal third. The original scar would be englobed within this strip surgery rather than creating a secondary scar. 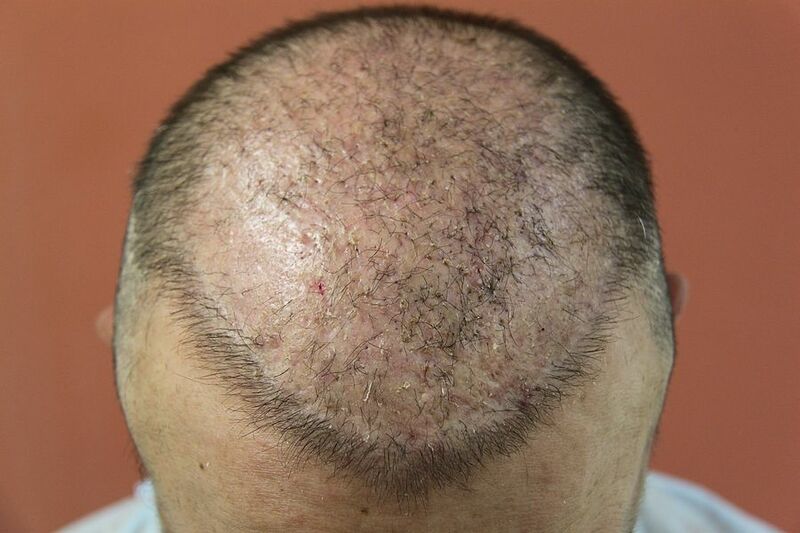 Due to the condition of the scalp in the recipient along with the goals of the patient, coverage rather than density was the main objective here, spreading the grafts to give them the best chance of survival in the scarred recipient area. This case is really a significant repair job, the lack of donor, scarring in both donor and recipient area, and therefore was a challenging case to perform taking into consideration all of the constraints present. Here the photographs show the pre-operational design and immediately post operation, clearly showing the placement and resultant trichophytic closure. Many thanks to Synthetic for allowing this case to be posted, we hope that it will be both educational and inspiring to others. Usually the forum sentiment is to crucified the previous doctor but I must say whoever did the 1000 strip for him did a good job, not bad at all with the hairline. 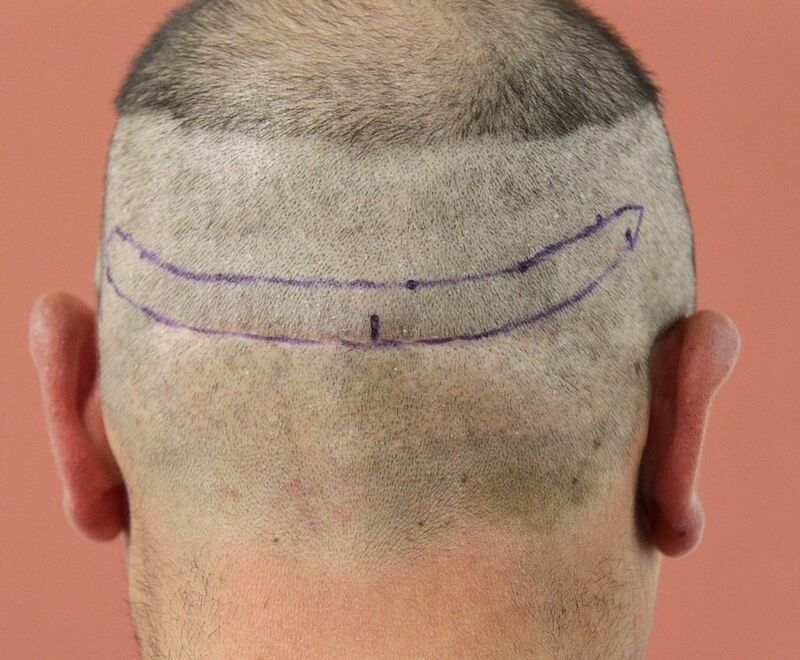 The prior FUE of just 400 graft decimated his nape donor and shows just how dangerous a bad FUE can be. Stephan. Could you provide graft numbers and placement density? I realize you guys typically recommend strip, but the scar does not seem worth it to me. In this case though, it makes sense because the patient already has a strip scar and can take advantage of the strengths of a strip procedure without too much of the downside. How many donor grafts do you estimate he has left for future HT? Why do you leave part of the head unshaven? 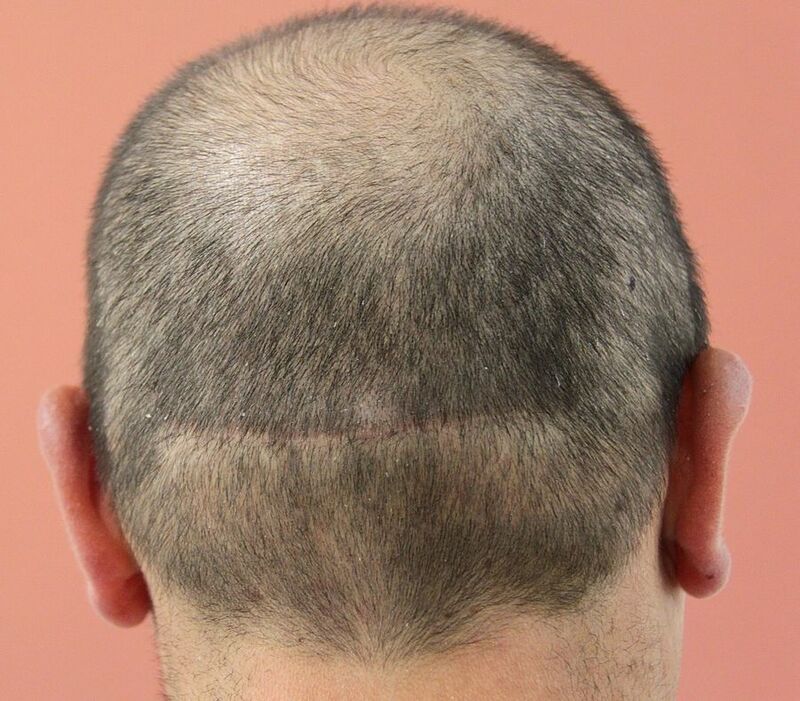 Does the pre-op narrow hairline represent 1000 grafts? It seems like less than that to me. BTW, the works looks good, I think he is going to end up with a great result. I agree, the original strip scar is quite thin , besides it didn’t stretch for almost 10 years. 1 Hair 161, 2 Hair 862, 3 Hair 821, 4 Hair 259. Ironically we are probably better known for our FUE rather than Strip, especially for smaller procedures under 3000 grafts. The density around the strip area was actually still very good, opposed to the sides that dropped in areas to below 50 cm2, so Strip was considered to be the best option to repair, he has a previous strip we could englobe, the density along the occipital was high enough that to harvest around 2000 grafts would not mean touching the sides and keep them for the future if required. The recipient was a minefield of ridging, cobblestoning and pitting from the previous surgeries and the synthetic placement so the density we placed was never going to be high to give the chance of the best yield. 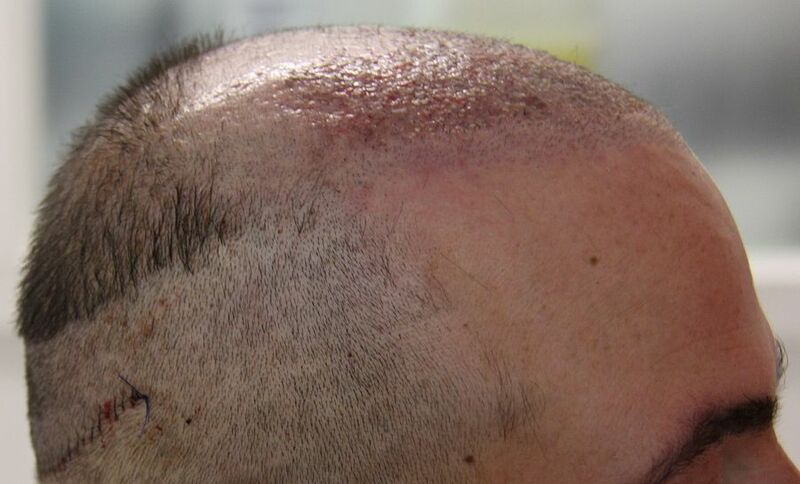 What was in his favour was good hair groupings, because the hair line was intact very few singles were used and the hair count for 2,3 and 4 hairs was good, total of 5384 hairs so an average of 2.56 hairs per graft, and this helped us place a lower than normal density considering the surface area but still achieve a natural result. It has to be understood also, synthetic has been around the block, he’s not expecting a full head of hair, maybe love still to have one:) but he is realistic about what can be achieved under the circumstances of his recipient scalp condition and the limitations to his donor. The shaving can be partly cosmetic, some prefer to keep a little hair and then we choose to shave it later so it is uniform and sometimes with it is to help the doc when making the slits to ensure we follow the natural direction and angles of the native hair. In respect of available numbers in the future, we’d prefer to wait, see how the healing of his strip goes, the laxity he still has and then possible numbers to look at another strip and possibly a small FUE, also beard and possibly upper chest hair. 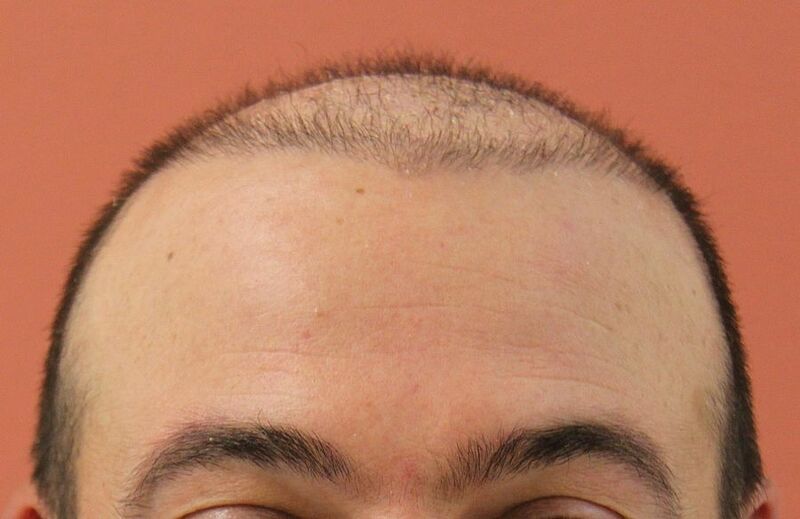 Can you post the name of the doctors who did his strip and fue before? 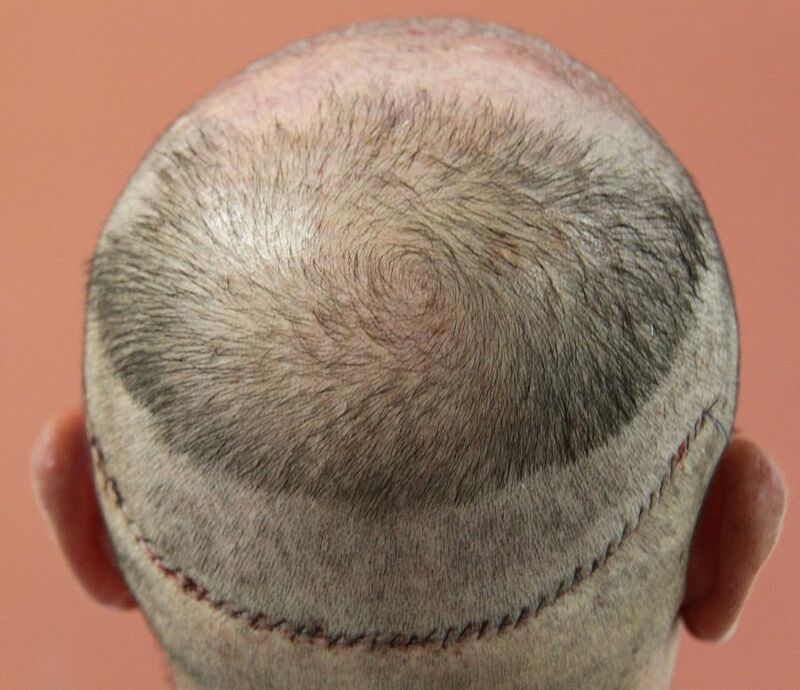 » Can you post the name of the doctors who did his strip and fue before? Yes please, it’s not helping anyone unless you let us know who are the doctors we should avoid. 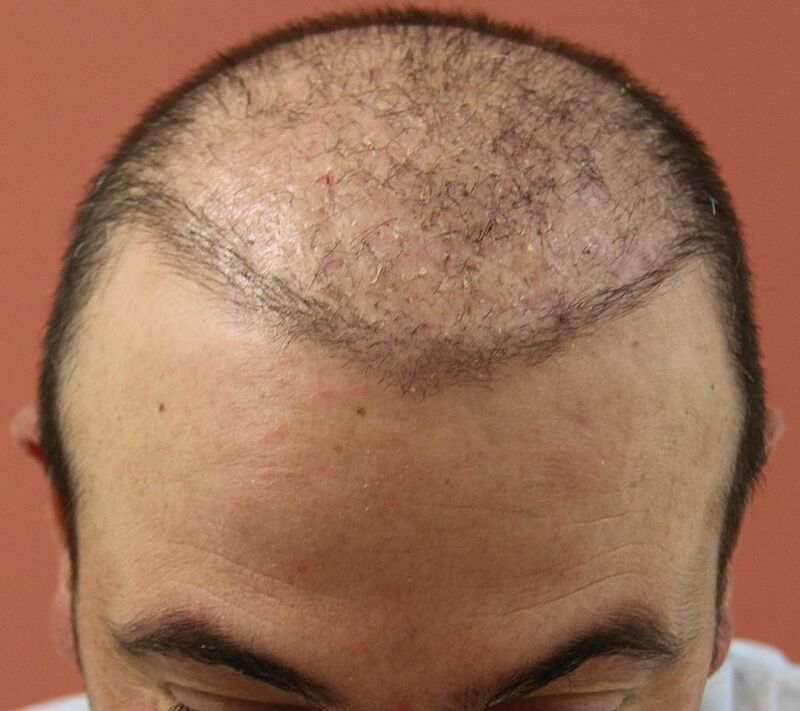 Hi , i just want to say that i was happy with the hairline , this was done by Dr Rogers in the uk , also my fue was done by Dr Gho you all know about him. 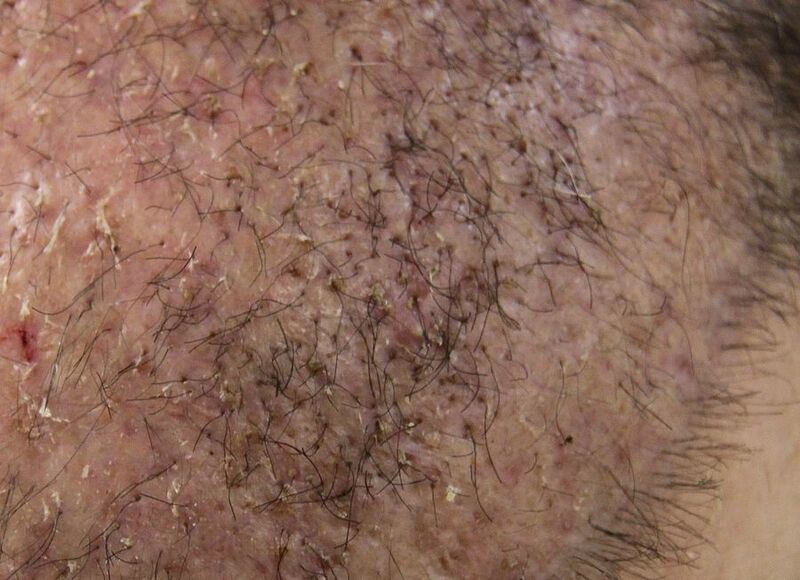 Yes it did thin out those areas , Dr Gho s procedure was supposed to have a pecentage of regrowth in the donour as he only took part of the follicle out but not sure if that actually worked. » giving him a frontal hairline but nothing else. Actually, I can’t see any “evident FUE-scarring” in his donor - maybe with a loupe? And how do YOU know, that there has been “little to no growth” in the recipient area? Did YOU know, WHERE the just 300 FUE grafts were placed? 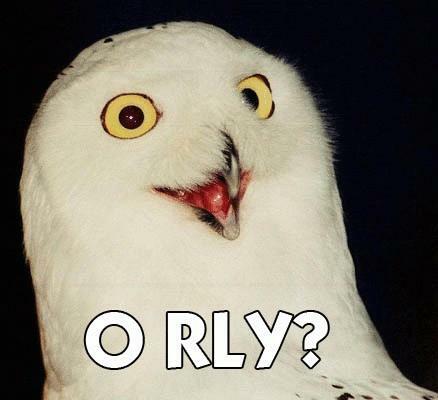 » out but not sure if that actually worked. I don’t like the idea of strip surgery for HT. The procedure should be banned. Only doctors who don’t give a damn are doing strip. Hi freddie all i can say is if my donour was better than avarage then fue would have been my choice , My scar is allready healing very nicely at month two and am very happy with it with my hair buzzed to number two guard so no regrets at all. » » out but not sure if that actually worked. Hey iron man your story is getting old and you are becoming boring leave the guy alone to say his own story as he wants and G(h)o f*** yourself, not everything in here is about protecting your sponsor. As HE wants ? No. … they all sponsor me in terms of KNOWLEDGE. » As HE wants ? No. » … they all sponsor me in terms of KNOWLEDGE.